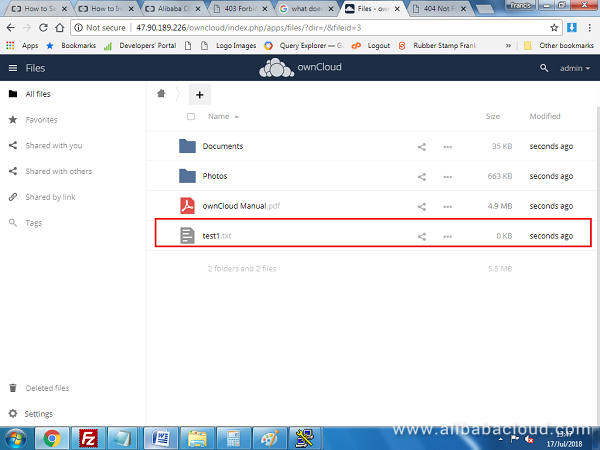 In this guide, we will take you through the steps of installing ownCloud on your Alibaba Cloud Elastic Compute Service (ECS) instance with Ubuntu 16.
ownCloud is a free and open-source file hosting software for storing, accessing and sharing files, calendars, contacts and emails on the cloud. 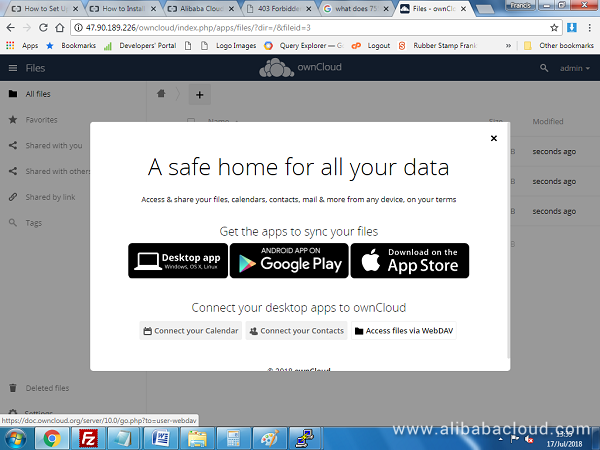 Since its development in 2010, ownCloud allows creation of private on-demand cloud that offers similar functionalities like those of Dropbox. 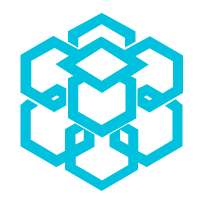 The application has desktop versions for Windows, macOS and Linux that offer synchronization capabilities with local computers. 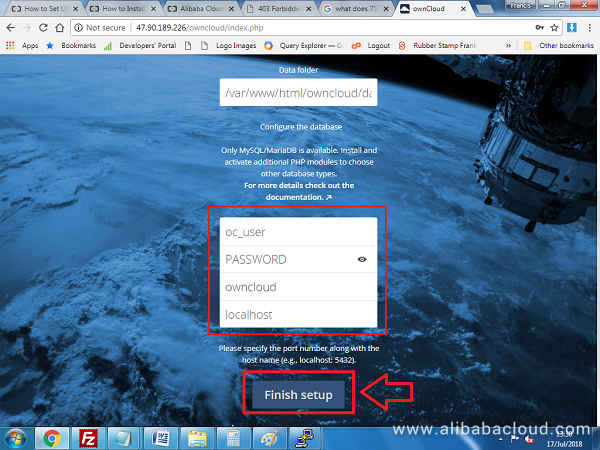 In this guide, we will take you through the steps of installing ownCloud on your Alibaba Cloud Elastic Compute Service (ECS) instance with Ubuntu 16.04. A valid Alibaba Cloud account. If you don't have one, register for free and get $300 worth in Free Trial. After the installation, you can enter your Alibaba ECS instance public IP address on a browser and you should see the default Apache web page. MySQL is the most comprehensive Relational Database Management System (RDMS) with a lot of modern features. It is also secure and scalable. Therefore, it works pretty well with ownCloud allowing you to scale up and down depending with your needs. Towards the end of the installation, you will be prompted to enter a root password for your MySQL server. This should not be confused with the password of your ECS instance. Enter a strong value and hit Enter to proceed. On the next screen, repeat the same password and hit Enter again. MySQL server installation should be completed successfully. The default installation of MySQL is not secure at all. You should run the command below to enhance its security. 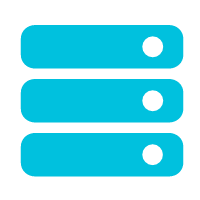 Enter the root password of your MySQL server that you setup earlier and press Enter. You should get a success message at the end. Enter your MySQL server root password and press Enter to continue. Next, grant full privileges to the database user we have created above. By the time of writing this guide, the highest PHP version supported by ownCloud was PHP 7.1. Press Enter when prompted to add the repository. You have now setup a web server, a database server and PHP scripting language. The server environment is now ready for running ownCloud software. Then use Linux wget utility to download the file from the link. 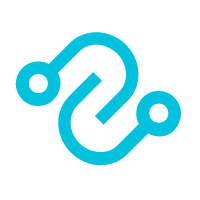 Allow a few seconds for the unzip utility to finalizing the process. The 755 file permission gives Apache web server read, write and execute permissions for the ownCloud directory. 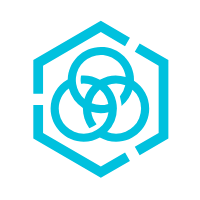 Remember to replace public_ip_address with the public IP address associated with your Alibaba Cloud ECS instance. You should see a configuration screen similar to the below image. Enter your preferred admin username and a strong password to continue. Leave the data folder intact. Then, scroll down to configure the database by enter the username and password that you created on the MySQL server and click Finish Setup. The installation should be finalized without any problems. 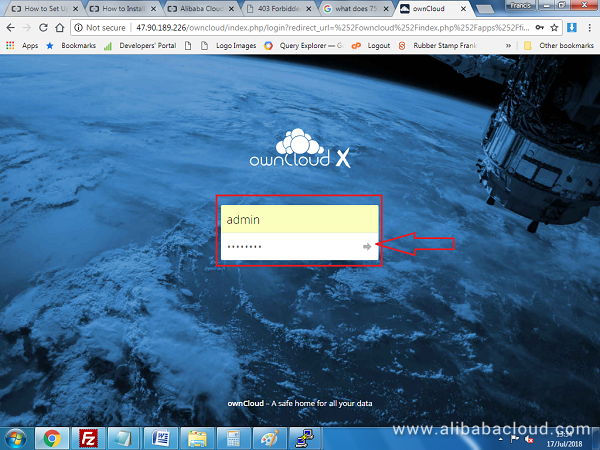 On the next screen, you will be prompted to enter ownCloud username and password that you created above. Enter the details and click the Login arrow. Any file you upload should now be available on your ownCloud server! In this case, a test1.txt file as uploaded for demonstration purposes. 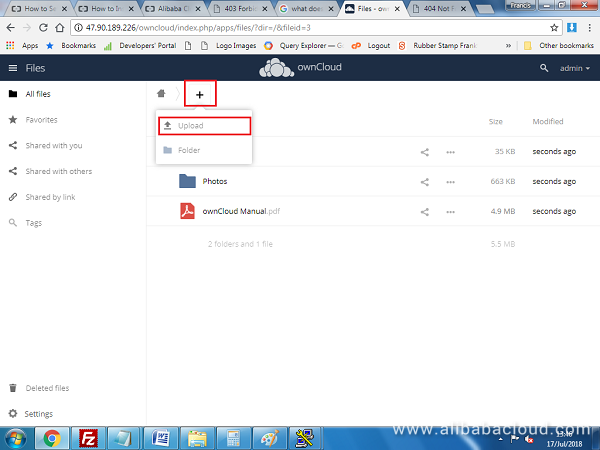 In the above tutorial, we have described how to setup ownCloud on your Alibaba Cloud Elastic Compute Service (ECS) instance running Ubuntu 16.04 Operating System. 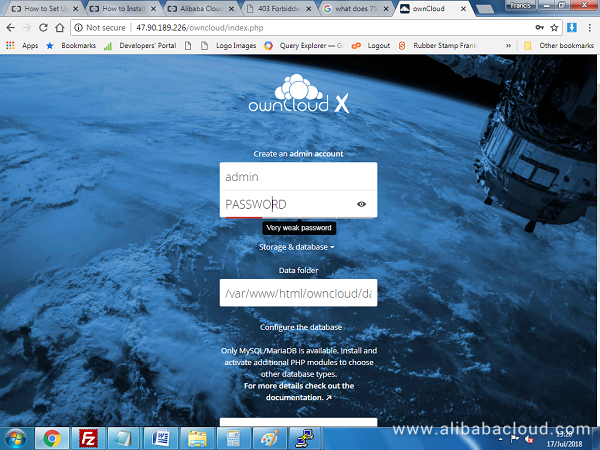 We have gone through the steps of setting up Apache web server, PHP scripting language, MySQL server and finally downloaded and installed ownCloud. You now have your own private cloud server that you can use to host your important files and share them for collaboration purposes.